My first experience with Studio Ghibli was watching Princess Mononoke. I had never seen Japanese animation before and was unprepared for the style, the action, and the dubbing. It was an art form that I wouldn't appreciate until years later, even though the studio was becoming famous worldwide. Mononoke, Spirited Away, Howl's Moving Castle, Ponyo, Arrietty, The Wind Rises, When Marnie Was There; these are some of the most widely-known and successful animated movies of all-time, though Americans continue to prefer Disney, Pixar, and other local animation studies. But the power of Ghibli can't be denied, as their films are an artistic medium all on their own and continue to amaze us with wonderful stories brought to life with dazzling talent. 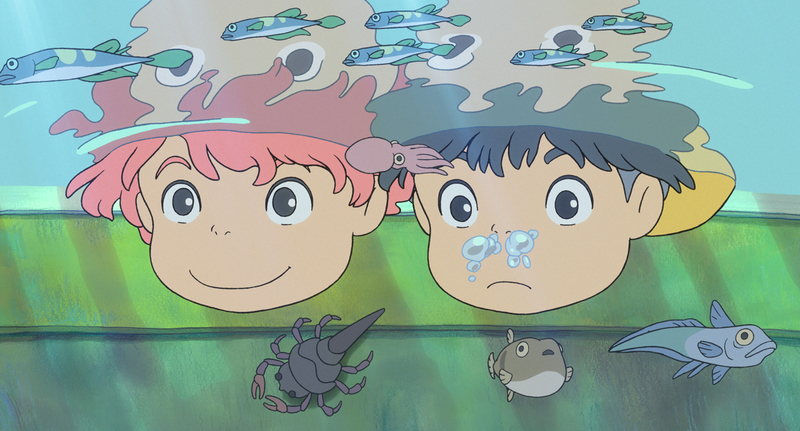 Loosely based on The Little Mermaid by Hans Christian Andersen, Ponyo is a tale of love breaking all boundaries. 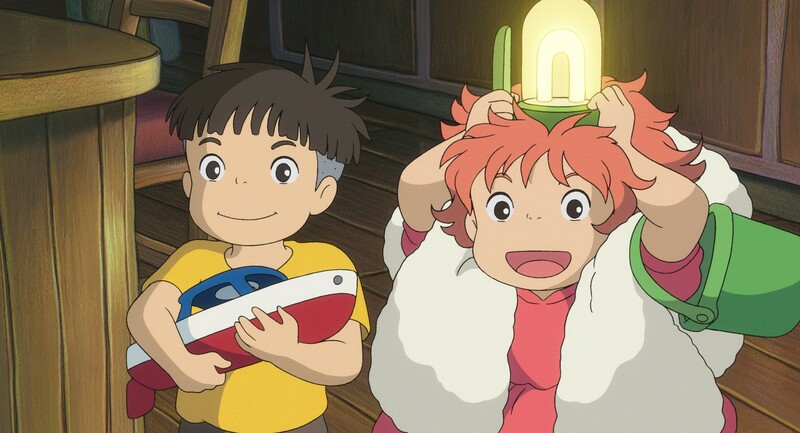 Sosuke is a young boy who lives near the sea with his mother & father. His mother works at a nearby retirement home, his father is a sailor. Sosuke happily relies upon his own independence and imagination, but when he happens to find a goldfish along the shoreline, he's overjoyed to finally have a companion. The trouble is, the fish he names Ponyo isn't a fish at all, but the daughter of a powerful sorcerer and the Sea herself. They need her to return to the ocean, to keep the balance between life on land and life under the sea, but Ponyo's love for Sosuke is too powerful a thing to be set aside for the survival of the world as we know it. 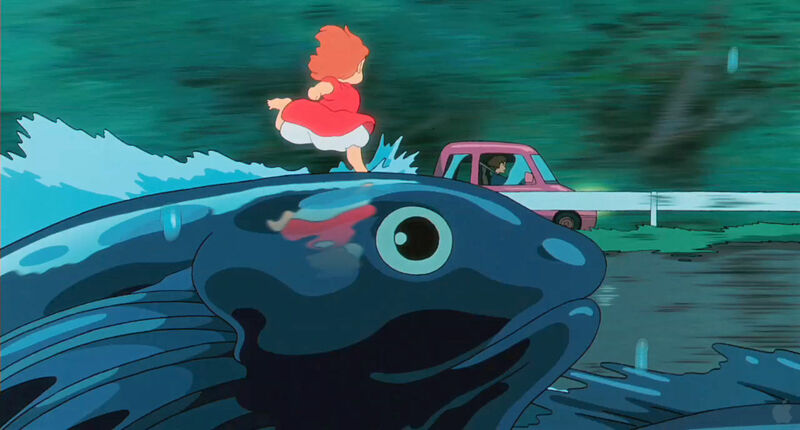 Ponyo's magic delights her new friend, but it also releases the forces of nature in ways that she cannot control. 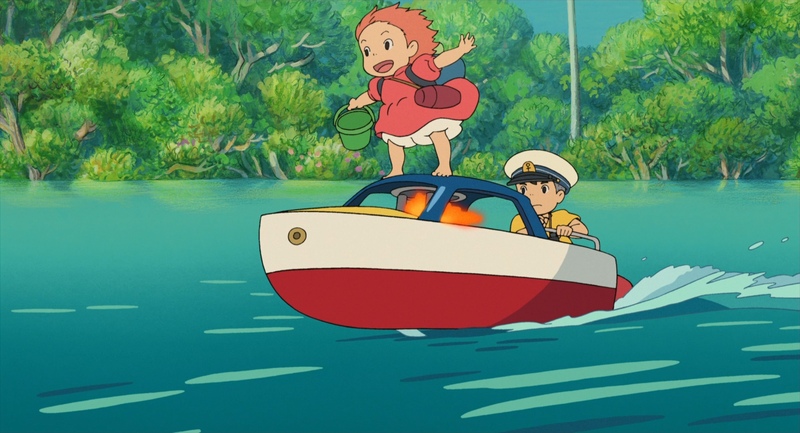 Ponyo's transformation into a human girl throws off the balance of the Earth, and causes the Moon's misalignment, resulting in a storm the likes of which Sosuke's tiny shipping village has never seen before. Her mother and father are desperate to take her back to her home before total destruction ensues, but they also know that they cannot rip apart her love for this special little boy, or for a human world that is so full of delights. 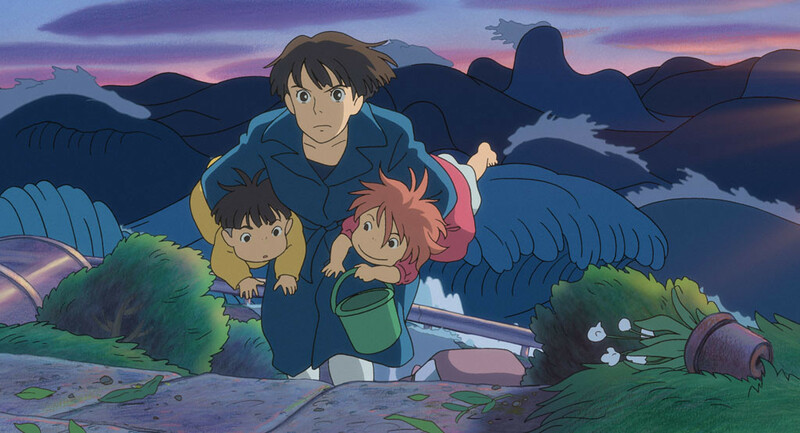 Ponyo and Sosuke will have to work together to prove that their love for each other is stronger than the gravity that wishes to pull them apart, and that they are willing to fight for what they know feels right. Studio Ghibli makes another masterpiece; what else is new. Ponyo is just another beautiful depiction of a classic tale, a reimagining of a story we thought we knew so well. It's very, very different from Disney's Little Mermaid, holding tight to the original content in some ways, and creating something completely new in others. It's as if that tale happened in modern Japan with children as the protagonists, the result becoming something better than you might predict. The color, the brilliant artwork, the stunning visuals; breathtaking all. And the cast was pretty impressive, apart from the two youngsters, who we'll root for to make names of themselves as well. Tina Fey, Liam Neeson, Matt Damon, Cate Blanchett, Cloris Leachman, Betty White, Lily Tomlin; top that if you can. I might have liked Arrietty just a touch more than Ponyo, appreciating its slow pace, deep moments, and phenomenal music. But Ponyo held its own, will delight children, and impressed me as a singularly unique film in a world of recycled time-wasters. It's very different from Ghibli's more mystical features, like Mononoke or Spirited Away, and always feels directed at children, with their interests at heart. But I don't see that as a bad thing; an animation studio, no matter how deep and adult their themes, should always remember the passion with which children appreciate animation, which is perhaps why adults can continue to love it no matter how old they get. This is a powerful art form, Ghibli wielding its tools with fine and magical precision. Video: With an aspect ratio of 1.85:1 (1080p HD Widescreen), the video quality of this Blu-ray version of Ponyo is among the best you will ever watch. Animated or not, this film is a spectacle to see, a marvel to sit down in front of. The color, the imagination, the backdrops, the characters; it's perfection all-around. One of the most beautifully draw features you will ever see, Ponyo's visuals will blow you away. Audio: The Blu-ray was done in English 5.1 DTS HD, with an option of Japanese 5.1 DTS HD or French 5.1 Dolby Digital. Subtitles are available in English SDH, English, or French. The film is dubbed from its original Japanese, but it loses nothing in translation. The dialogue is simple but clever, the voice-overs work in every way, the stars that got on board should be commended, and the music will delight you for years to come. Extras: The special features on this disc are among the most numerous I have ever come across. There are so very many, but thankfully they are also self-explanatory. Feature-Length Storyboards, The Five Geniuses Who Created Ponyo, The Locations of Ponyo, Press Conference: Theme Song Announcement, Theme Song Music Video, Interview with Hayao Miyazaki, Interview with Toshio Suzuki, Opening Event at Hibiya Scala-Za Theater, Hayao Miyazaki Press Conference at the Foreign Correspondent's Club of Japan, Behind the Microphone, Creating Ponyo, Ponyo & Fujimoto, The Nursery, Producer's Perspective: Telling the Story, Scoring Miyazaki, Original Theatrical Trailer, and TV Spots. Highly Recommended. If there's a more delightful modern animated flick out there, I'd like to see it, because Ponyo is currently the claimant to the crown. It's so magically delicious, and it broadcasts that joy to audiences of all ages. It's not the animation that Americans are most used to, but that doesn't mean we can't be open-minded, and that doesn't mean that some other form can't be just as great as what comes out of the studios that we're used to. The music is something that stands out as well, a common theme woven through a soundtrack that will live in your brain for days, but you won't want it to leave. The video is amazing, the audio spectacular, and the extras more than numerous, so the technical aspects live up to the content. For my money, this is one of Ghibli's best, something for every age group, and a film that will simply brighten your day.